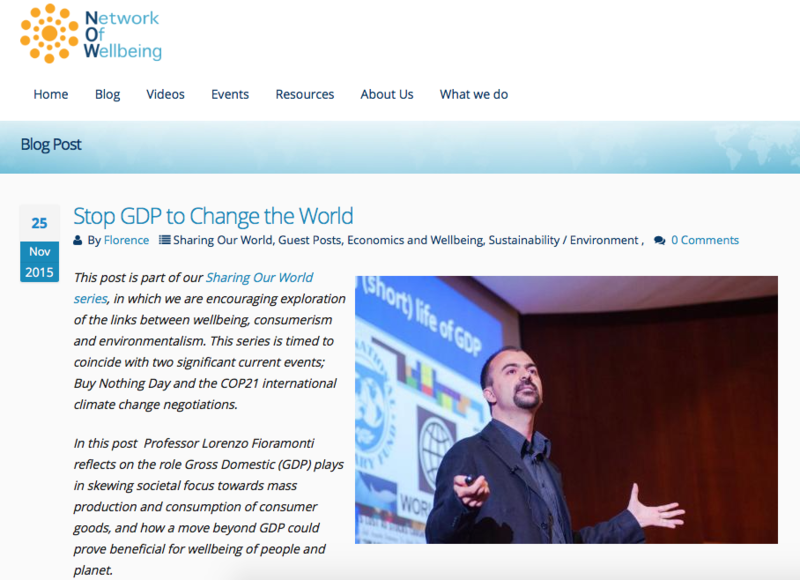 Read GovInn Director Lorenzo Fioramonti‘s guest blog post on the Network of Wellbeing website. The post is part of the “Sharing the World” series, which focuses on the links between wellbeing, consumerism and the environment. In this post, Professor Fioramonti discusses the negative roll of Gross Domestic Product, and the need to move the focus from a production and consumer centred approach to one focused on the wellbeing of the people and planet. Traditionally our societies have pursued a narrow definition of economic growth as a means to attain development. Over time, the means has become an end in itself. We now associate development with growth, although the two are by no means synonymous. More importantly, the very meaning of development needs to be questioned, as its underlying nature should indicate a process-based functionality rather than an end goal. Development cannot be the end goal: it is itself a process towards a higher state of evolution. How we currently measure this process needs to be changed, to move beyond the limits of GDP. Read the rest of the article on the Network of Wellbeing website. Read about GovInn Director Lorenzo Fioramonti’s participation in “Measuring Well-being and Development in Africa” discussion, as written by Colleen Dardagan for The Mercury. ICHIRA Tambo, who heads Japan’s International Co-operation Agency Research Institute, tells this story: “When I was a college student 35 years ago, I worked in facilitation, co-ordination and interpretation for development country participants in a training programme in Tokyo on underground water development. “The students bought many electronic devices such as radios, televisions, calculators and phones. These were gifts for their families and friends back home. But there was one exception. An Ethiopian engineer did not buy anything. One day, I asked him why. 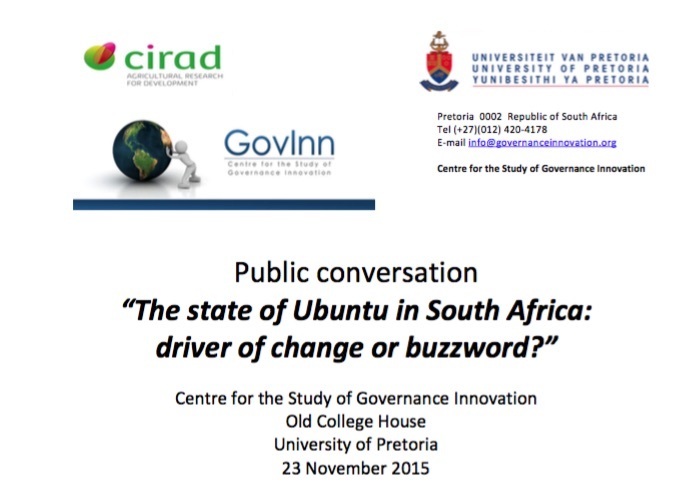 Please join GovInn in a day long workshop, where noted South African thought leaders will discuss the state of Ubuntu and it’s place in the current South African social and political system. The aim of the workshop is to assess whether Ubuntu is merely a buzzword, or whether it is a a force of change in South Africa. 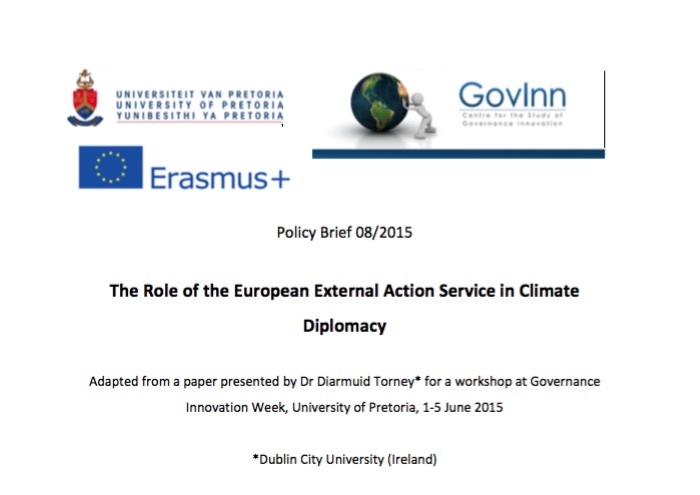 Adapted from a paper presented by Dr Diarmuid Torney for a workshop at Governance Innovation Week, University of Pretoria, 1-5 June 2015. The 2009 Copenhagen climate change summit highlighted the European Union’s (EU) inability to shape international outcomes in line with its own preference. Similarly, the EU’s, responses to the Arab Spring and the Iraq war revealed the Union was either unable or unwilling to respond effectively to global crises. Some explanations for the varied and sometimes limited effectiveness of the EU on the world stage focus on the institutional complexities of the EU and its apparent inability to “speak with one voice” internationally. Other explanations link broader changes in world politics, since the 2008 global financial crisis, with a decline in the power of the EU.1 2 While these two perspectives explain important parts of the story, they each tend to neglect the importance of the other. Perspectives emphasising intra-EU factors often fail to adequately appreciate how the international context conditions the scope for EU external governance. Equally, perspectives focusing on the international context often seem to strip the EU of agency, viewing it simply as a passive receiver of that international context. Adapted from a paper presented by Professor Roberto Dominguez at Governance Innovation Week, University of Pretoria, 1-5 June 2015. This policy brief examines the European Union’s (EU) contributions to environmental governance in Latin America over the past two decades. 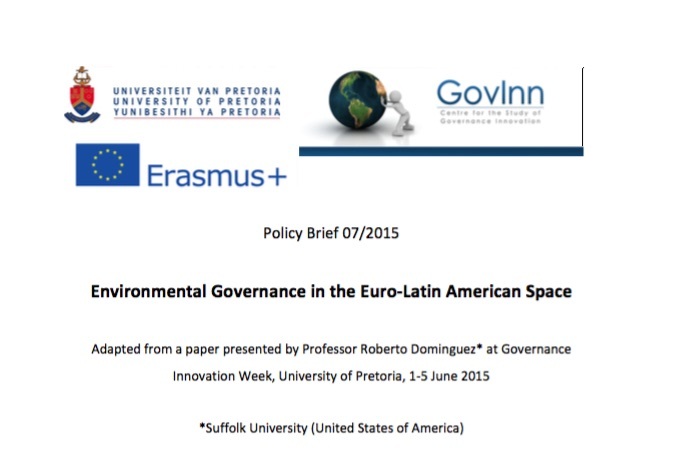 Two elements are salient in characterising environmental governance in the EU-Latin American relationship. The first is the weak economic relationship between the two regions. While there are deep cultural roots between Latin America and individual EU countries, trade relations remain at a modest level. This gives the EU a relatively low level of leverage over Latin American countries compared to, for example, European neighbourhood countries. In addition, other closer trading partners, such as the US, have much more opportunity to promote environmental governance through instruments such as Free Trade Agreements. 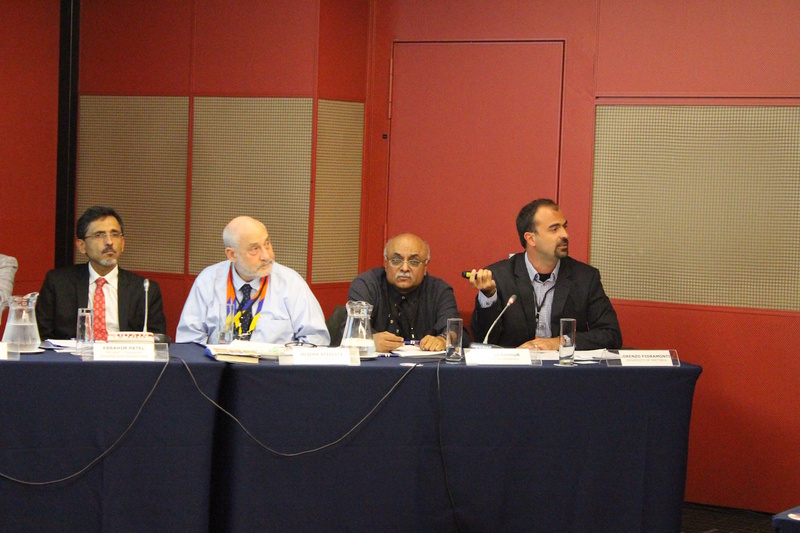 The second element is the apparent low priority of the environment on the bi-regional agenda. While the environment does appear in high-level speeches and strategies it is usually mentioned only briefly and secondary to issues of trade and investment. From 2000 onwards, however, the environment has gradually increased in profile in EU development programmes in Latin America both at a regional level and within individual countries. This review of EU environmental programmes and projects in Latin America indicates that, through the EU’s development cooperation, the environment could play a significant and increasing role in Euro-Latin American relations. Adapted from a paper presented by Professor Tom Delreux at the 2015 Governance Innovation Week, University of Pretoria, 1-5 June 2015. The EU is party to about 50 Multilateral Environmental Agreements (MEAs)1 and plays a key role in international negotiations on a broad range of environmental issues such as air, climate change, biodiversity and biosafety, chemicals, soil, water, sustainable development, forests or oceans. Some of these MEAs are global in nature, and negotiated under the auspices of the UN, while others are regional, and mostly negotiated under the auspices of the United Nations Economic Commission for Europe (UNECE). 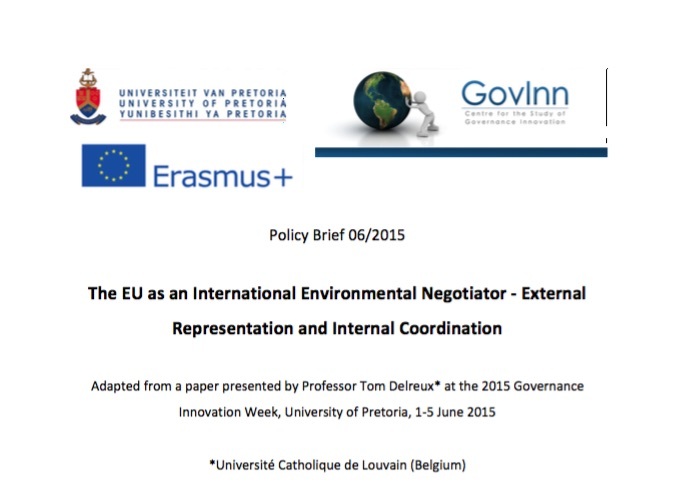 This policy brief opens the black box of the EU as international environmental negotiator. By focusing on how the EU functions internally when it acts externally, it discusses the legal framework of the EU’s external environmental competences and its formal status in international environmental negotiations, the way the EU is externally representation (who speaks for the EU?) and the way the internal coordination takes place (how is a EU position developed?). 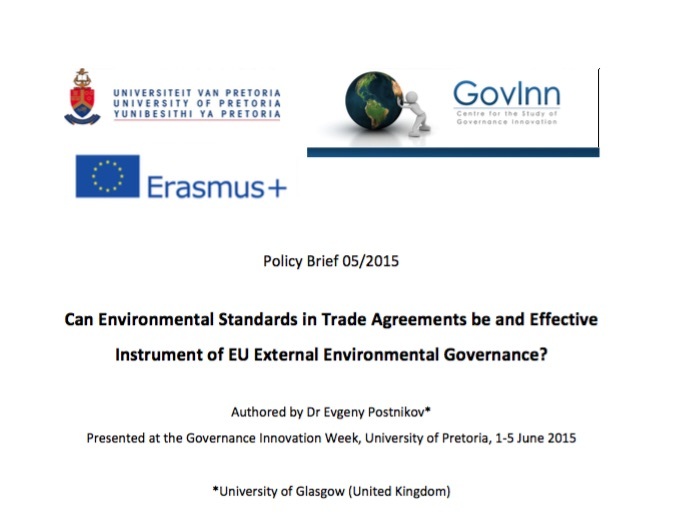 Can Environmental Standards in Trade Agreements be and Effective Instrument of EU External Environmental Governance? Authored by Dr Evgeny Postnikov. 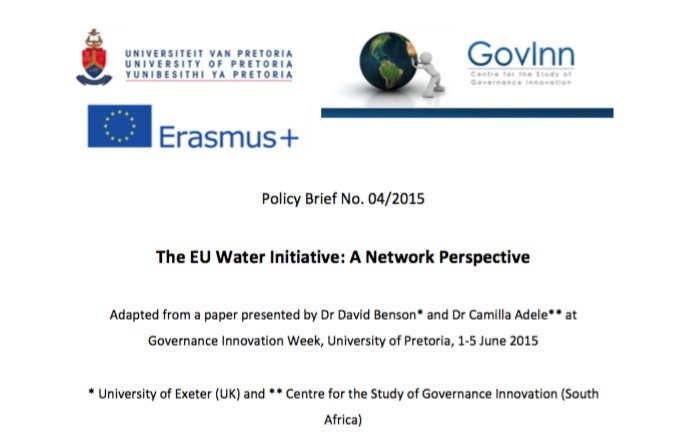 Presented at the Governance Innovation Week, University of Pretoria, 1-5 June 2015. The European Union (EU) has spearheaded the signing of bilateral preferential trade agreements (PTAs) with multiple countries across the developing world. Theses agreements play an increasingly important role in the EU’s external environmental governance toolkit, as they include provisions requiring trading partners to maintain certain levels of environmental protection, also known as environmental standards. This policy brief aims to provide a holistic assessment of environmental standards in EU PTAs and critically evaluate whether they fulfil their potential as an effective instrument of EU external environmental governance. http://governanceinnovation.org/wordpress/wp-content/uploads/2015/11/Postnikov.jpg 519 676 GovInn http://governanceinnovation.org/govinnedev/wp-content/uploads/2019/02/Govinne-logo.png GovInn2015-11-16 15:16:462019-04-04 16:02:32Can Environmental Standards in Trade Agreements be and Effective Instrument of EU External Environmental Governance? Adapted from a paper presented by Dr David Benson and Dr Camilla Adele at Governance Innovation Week, University of Pretoria, 1-5 June 2015. As internal European Union (EU) environmental policy reaches a stage of relative maturity,1 there is increasing focus on how the EU can influence the governance of environmental issues, not only inside but also outside of its borders. This ‘external environmental governance’ seeks to transfer EU environmental norms, principles, and polices well beyond their legal jurisdiction.2 This type of governance has led to a move away from traditional hierarchical means of transferring environmental norms, principles, and policies (e.g. through top down regulation), towards an increasing reliance on more horizontal forms of governance such as transnational policy networks. These networks span international boundaries and comprise of both state and non-state actors come together around shared policy problems in relatively horizontal and informal patterns of social relations. The use of this type of transnational networks is particularly evident in the EU’s external water policy and specifically its EU Water Initiative (EUWI). The purpose of this policy brief is to analyse how effective the use of transnational networks are in the transferring of EU environmental norms, principles and policies. To do this, the brief examines one regional component (or network) of the EUWI, namely the African Working Group (AWG). Adapted from a paper presented by Dr Camilla Adelle and Ms Sally Nicholson at Governance Innovation Week, University of Pretoria, 1-5 June 2015. The EU is committed to protecting the environment and pursuing sustainable development not only within Europe but also globally. In quantitative terms, the EU’s development policy (covering more than 100 countries and providing over €50 billion a year in aid) has a huge practical potential to support environmental protection objectives and processes beyond the EU’s borders.1 Tackling environmental issues is also seen as essential for achieving development objectives, as many people in developing countries rely on healthy ecosystems for direct consumption and/or income generation. 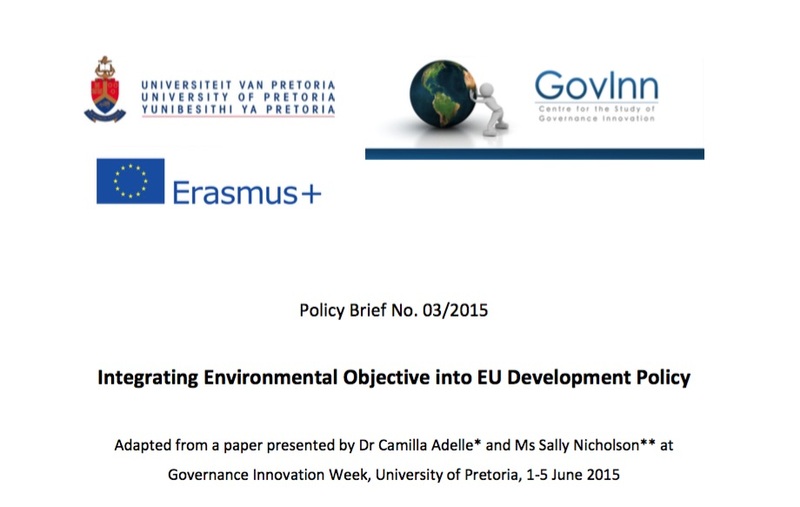 This policy brief seeks to examine the extent to which the EU integrates environmental objectives into its development activities and so harness the potential of these activities to not only pursue the EU’s development objectives but also the EU’s external environmental objectives. 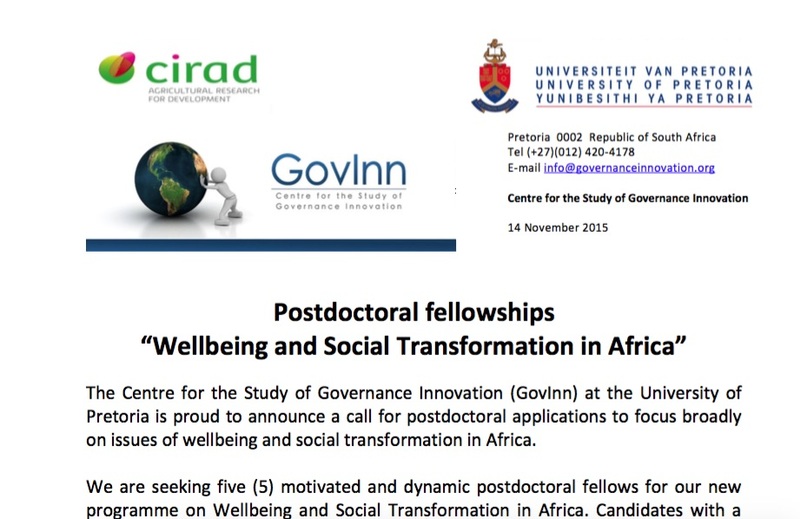 The Centre for the Study of Governance Innovation (GovInn) at the University of Pretoria is proud to announce a call for postdoctoral applications to focus broadly on issues of wellbeing and social transformation in Africa. http://governanceinnovation.org/wordpress/wp-content/uploads/2015/11/Wellbeing.jpg 598 921 GovInn http://governanceinnovation.org/govinnedev/wp-content/uploads/2019/02/Govinne-logo.png GovInn2015-11-16 13:07:462015-11-16 13:07:46Postdoctoral fellowship: " Wellbeing and Social Transformation in Africa"